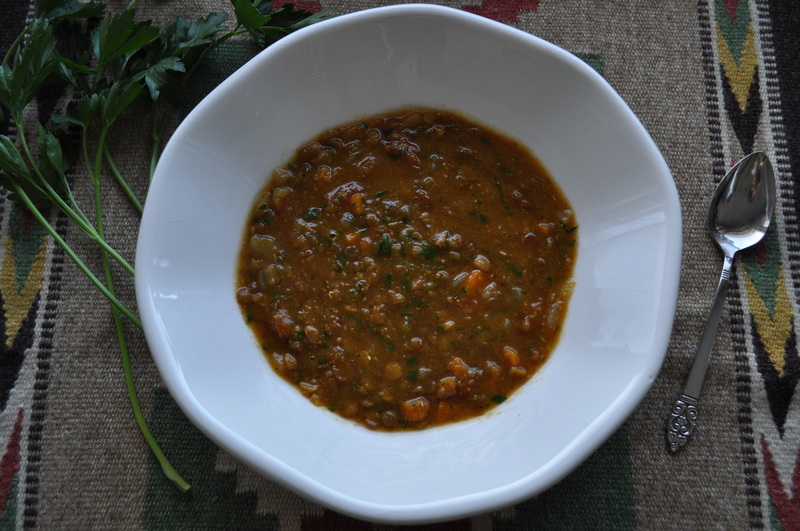 Curried Lentil Soup – Got Nourishment? America’s Test Kitchen has done it again! This is an easy and nutritious meal for any time of the year. I came down with a summer cold, so had a hankering for some hot soup. This recipe stuck out to me because it is fairly quick, easy, and puts a twist on your classic lentil soup! Curry is one of my favorite spices, so I couldn’t wait to dig in. Now, I don’t know if any of you have any….er, issues with legumes. But lentils seem to be one of the easiest legumes to digest without any side-effect of discomfort! Not only that, but they are packed with protein, fiber, iron, calcium, and folate. Sounds like a win to me! If legumes do give you some discomfort, you can try to incorporate small amounts at a time into your diet, which allows your body to build up the enzymes that break down these starches. Fun fact: Did you know that you get the most health benefits from your garlic if you let it sit for about 15 minutes after chopping (or crushing) before cooking? This allows time for an enzyme reaction to occur, which “unlocks” the healthy compounds. Mise en place! 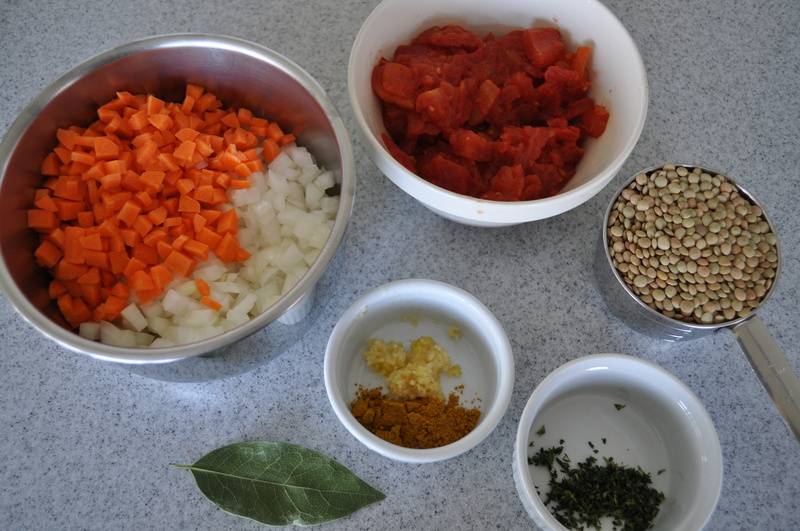 (“set in place”) – makes cooking so much easier! 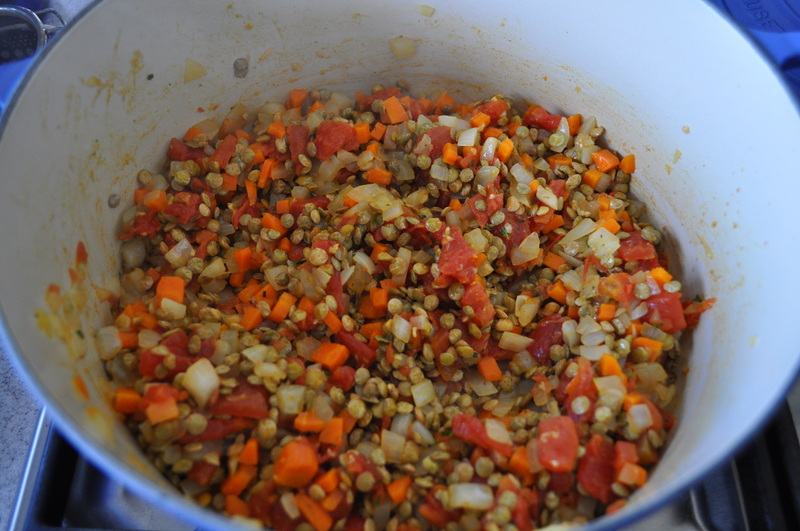 After cooking the lentils and veggies together, you first add wine before adding any of the other liquids. Scrape the bottom of the pan immediately after adding the wine. Wine is my FAVORITE way to deglaze a pan. Deglazing is a cooking technique to remove residue on the pan and add flavor to your dish. You can also use vinegar, but the combination of wine with onion and garlic always makes me drool! Voila! Feel free to add extra parsley to your bowl. Something I learned from one of my nutrition Professors in school is that you can never add too many fresh herbs! I completely agree! They are a great way to add flavor without adding extra salt or fat. Heat the oil in a Dutch oven over medium-high heat for about 2-3 minutes. Add onion and carrots and cook until barely soft, about 2 minutes. Add garlic and curry and cook about 30 seconds. Add lentils and 1/4 teaspoon salt. Cover, reduce heat to medium-low, and cook about 8 to 10 minutes. Uncover, increase heat to high, add wine, and bring to a simmer. Stir in broth and water and bring to boil. Partially cover pot, reduce heat to low, and simmer about 30 to 35 minutes. The lentils should be tender, but not mushy. Remove the bay leaf. Puree 3 cups soup in blender until smooth, then return to pot. Heat soup over medium-low heat for about 5 minutes. Stir in parsley.